This is one of our most durable heat press machine with affordable price and years of trouble free performance. Full digital time and temperature control. Heat transfer presses are the perfect solution for small businesses, include heat transfer papers. This simple machine can make transferring your images to T-shirts, jeans, pillow cases, jigsaw puzzles, mouse pads, ceramic tiles etc any flat surface. 1. 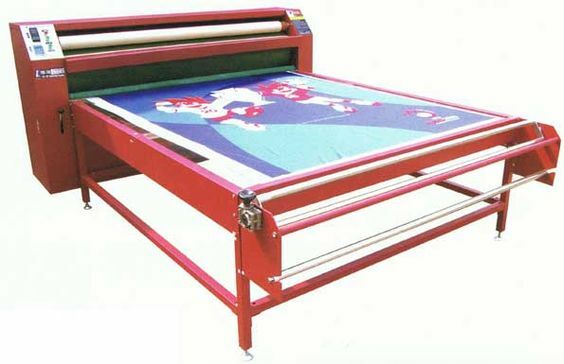 This machine can heat transfer print color patterns and words painted with subliming ink and solvent ink on textile fabric such as cotton, hemp and chemical fiber. 2. Floss and sparkle heat printing. 3. The machine introduced advanced and imported units to assure the exact controlling of the temperature. 4. Equipped with continuous speed adjustment system, you can adjust printing speed as you need.The roller was heating up with oil and temperature heating system. 5. Then have more even and stable temperature. 6. Zonal blanket is apart with roller that assures the service span of the Zonal blanket and has more convenient tension system. 2. Digital temperature and speed controller,adjustable speed. 4. Using imported heating pipes,heat evenly,durable;imported blankets which is not easy to deviate. 1. How wide is the machine? 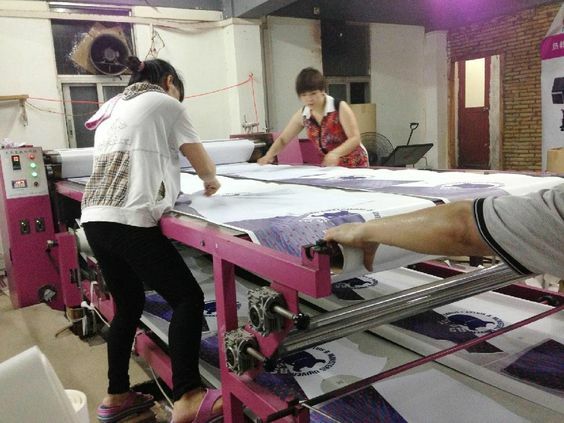 150-200 meters per hours, depend on the fabric and the transfer speed. We also offer sublimation paper and sublimation ink! We provide one-stop services!